The medical examiner of Harris County, Texas, has confirmed five deaths directly stemming from Tropical Storm Harvey. A spokesperson for the office says another eight deaths that may be linked to the storm are awaiting autopsy. The ME names four of the victims, including police Sgt. Steve Perez, whose death was announced today. Federal, state and local officials haven't been keeping an overall, official death toll for the storm. Levees and dams in eastern Texas are struggling to contain massive amounts of water dropped on the area by Harvey, with millions of gallons of water running over the tops of spillways at dams in the Houston area. Mayor Sylvester Turner has adjusted the time of a curfew he had announced earlier Tuesday evening. It will run from midnight to 5 a.m. every night until further notice. It was imposed because of the danger of driving on flooded streets and because there have been some break-ins and looting. Persistent rain is "pushing the Addicks and Barker reservoirs to record heights" and forcing water over the reservoirs' spillways west of downtown Houston, reports Andrew Schneider of Houston Public Media. In an update for our Newscast Unit, Schneider adds, "The two reservoirs hold more than half a billion cubic meters of water combined. The dams that created the reservoirs are rated among the most unsafe in the country." Northeast of downtown Houston, millions of gallons of water are coursing over the spillway of the Lake Houston Dam on the San Jacinto River — around midday Tuesday, the rate was 375,000 cubic feet per second, or "168 million gallons per minute," meteorologist Jeff Lindner of the Harris County Flood Control District says. In the past four days, Lindner adds, Harris County has been hit by enough rainwater to run Niagara Falls for 15 days: 1 trillion gallons. In Brazoria County, a levee breached at Columbia Lakes some 60 miles south of Houston, prompting officials to tell residents: "Get out now!" On Tuesday afternoon, a rain gauge east of Houston reported 51.88 inches of rain since Friday. The preliminary report indicates a rainfall record for the contiguous United States, breaking one set by Tropical Storm Amelia in 1978, the National Hurricane Center said. "That figure is going to keep climbing," said National Hurricane Center spokesman Dennis Feltgen. Two other Texas gauges exceeded the previous record of 48 inches set by Amelia, the National Weather Service added. Hurricane Hiki, which hit Hawaii in 1950, has the U.S. record for a tropical cyclone. Fifty-two inches of rainfall were documented at the Kanalohuluhulu Ranger Station on Kauai. In the large-scale chaos that the storm has brought, emergency crews have been working to save stranded residents and cope with the flow of evacuees — even as more rain is forecast for areas that have already been flooded. For its part, the Coast Guard said Tuesday night that it has rescued 4,300 people in the Houston area since Sunday and has more than two dozen helicopters and planes patrolling. NPR's Kirk Siegler reports for our Newscast desk, "The Coast Guard is urging people who are still waiting to be rescued to stand on their roofs and, at night, hold up flashlights or the lights on their cell phones so that rescue crews wearing infrared goggles on air patrol can spot them. " Houston Police Chief Art Acevedo said Tuesday that his department had rescued more than 3,500 people and was working both to save more residents and to prevent looting. The city's fire chief, Samuel Peña, said the fire department had responded to 1,000 calls. Later in the day, city officials confirmed that a Houston police officer was killed in the flooding on Sunday. Police Sgt. Steve Perez, 60, was "caught in floodwaters while driving to duty," Houston Mayor Sylvester Turner said in a tweet. Perez was a 34-year veteran of the Houston Police Department. Houston's convention center is sheltering more than 9,000 people — far more than the 5,000-person capacity that had been set. "The George R. Brown Convention Center is chaotic, with thousands of people camped out on the floor throughout the sprawling facility," NPR's Rebecca Hersher reports. "Police, National Guard and hundreds of volunteers are trying to keep up — serving meals, passing out blankets and air mattresses as they have them." "There are probably about 12,000 or 13,000 thousand [people] in shelters," Turner told All Things Considered on Tuesday. "The city is still opening shelters. ... We've become a regional center for people who are coming from counties outside the city of Houston. They're still evacuating and in their moment of need and we're not going to turn anyone away, whether they're a Houstonian or not a Houstonian." Water has risen above the spillway at the dam at the Addicks Reservoir, where the Army Corps of Engineers began releasing water early Monday in hopes of controlling the massive amount of water. The spillway's elevation is 108 feet; the water was measured at 108.7 feet early Tuesday afternoon. An official with the Harris County Flood Control District says it's the first time the Addicks Dam has spilled over the top, NPR's Greg Allen reports. The water will endanger more homes and add to the flooding that has crippled the area. As we reported Monday, officials urged residents who live near the Addicks and Barker reservoirs to evacuate or monitor water levels, as the Corps announced that rising levels were forcing the release of water. "Rainfall totals from the past 12 hours show #Harvey is winding down, but not done yet," the Houston office of the National Weather Service said Tuesday. Record-setting rains in Harris County, which includes Houston and is home to some 4.6 million people, knocked several water level gauges and rain sensors out of service, the Harris County Flood Control District said. Parts of the state have already seen flooding — and heavy rains are predicted to hit the state as well as parts of neighboring Arkansas on Tuesday night and into Wednesday, the National Weather Service says. There are problems in New Orleans, where officials say a key drainage pump was knocked out by a fire on Monday and must now be repaired. "The announcement from Mayor Mitch Landrieu came after 4 inches of rain earlier in the day caused street flooding in neighborhoods across the city," member station WWNO reports. The news comes in the same week the city marks the 12th anniversary of Hurricane Katrina. The problem pump is the same one, WWNO adds, that had recently undergone repairs after "flooding earlier this month exposed infrastructure failures and unreported maintenance issues." "Harvey is expected to produce additional rainfall accumulations of 7 to 13 inches through Friday over parts of the upper Texas coast into southwestern Louisiana," the NHC said in an update Tuesday morning. 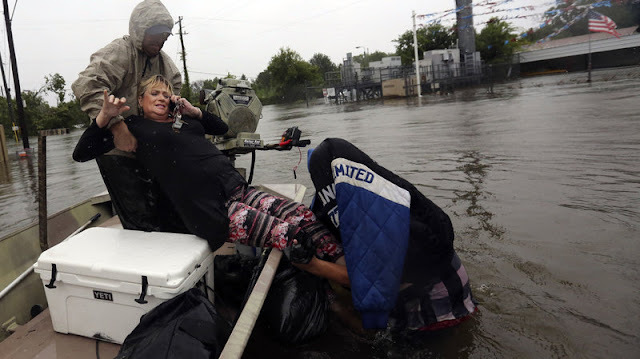 Flash flood warnings and mandatory evacuation orders were issued for yet another day by officials along the Texas and Louisiana coasts, where the storm is dropping catastrophic amounts of rain. "Isolated storm totals may reach 50 inches over the upper Texas coast, including the Houston/Galveston metropolitan area," the NHC says. More than three days after Harvey made landfall as a Category 4 hurricane, the storm's center is back out over the Gulf of Mexico, south of Galveston. The storm is moving east-northeast at near 3 mph. It's expected to remain offshore Tuesday night and return inland on Wednesday. Heavy rain is predicted along the Gulf Coast, with the NHC warning of 5 to 10 inches of rainfall in southeastern Louisiana and coastal Mississippi and Alabama and total rain accumulations of 5 to 15 inches across south-central Louisiana. 0 Response to "Five Deaths In Houston Blamed On Harvey; Other Deaths Being Investigated"